"CLOSE ENCOUNTERS OF THE ADHD KIND"
ADHD is viewed as a handicap. But it may well be these very qualities that will help advance humanity from its limited 3rd dimensional mindset as Neil suggests in his book. I feel such a book is long overdue. ADHD better designates a non-conventional way of learning that promises to incorporate a greater assortment of perspectives and ideas. The behaviour of those with ADHD is analogous to one trying to break out from the small confines of the human brain socialized to think in linear terms in understanding the world. This amazing story is the saga of one man's struggle, to come to terms with the fact that he was different in an age when that difference was neither understood nor identified. In learning to cope with his ADHD condition he discovered that his abilities to read and relate to people of diverse backgrounds, origins and asperations were vastly enhanced way above the norm to an astounding and intuitive degree. This is an extremely courageous book which touches on what is perhaps the most perplexing and important issue of our time – where we have come from as humankind, what we are doing to ourselves and our planet in so many different realms from the psychological to the ecological, and what impact our conduct may be having on other life forms in the universe. Neil Gould has dared to say that the Emperor has no clothes on. He invites his readers to listen to their intuitive reasoning when addressing these profound issues and to consider seriously the previously unthinkable notions that we are not alone in the universe nor at the top of the food chain, to accept that alternative energies are indeed available in a planet polluting itself to death with toxic hydrocarbon based fuels and to come terms with the fact that a more spiritually aware and advanced world collaborating on vital national and international issues rather than fighting over them, will ultimately prove to be a vastly improved, healthier, more productive, optimistic and happier place in which to live. It is a story of courage and creativity as well as trauma. Time and again he is abused, abandoned, and attacked. His boyhood terrain of South Africa is simultaneously mystical and brutal. As a result his brain, like a metronome, clicks between seeking creative stimulation amid a brain riddled with paralyzing trauma scars. Leap—scar—leap—scar. Trauma becomes a perfect recipe for his relentless cognitive obsession with risk, that is more often than not, rewarded with punishment, isolation, and a brick wall of cultural tradition. His ADHD cry echoing, “What’s wrong with everyone?” He prevails by reaching beyond his brain into the multiverse of consciousness. He likens it to a computer browser where new screens appear to relieve human imposed boundaries. A lifespan of extraterrestrial contact, including downloads, communications, and experiences, launches him, at an early age, into Exoconscious dimensions. His honesty is translated into his own multidimensional story, and contact with ET intelligences. His intuitive abilities and OBE’s (Out of body experiences) with ‘liquid light’ the experience of dimensional hyperspace, and ‘cosmic downloads’; which he terms an exoconscious reality. Neil has opened up Pandora’s Box by suggesting that ADHD maybe new software for Homo sapiens to give them abilities to perceive a broader multi dimensional reality, that could well explain that ADHD is not so much a dysfunction, but one of the new programs for upgrading our species. Neil Gould is a multi-faceted individual who combines a variety of business practices with ET contact/disclosure advocacy. His is a landmark book, presenting for the first time the thesis that in some cases [not all cases] the symptoms of what is known as ADHD, rather than being an affliction are in fact the result of an advanced form of consciousness that comes with childhood extra terrestrial contact. Born in South Africa in 1954 he and his family emigrated to the United Kingdom in 1974 before finally residing in China and Hong Kong in 1995. 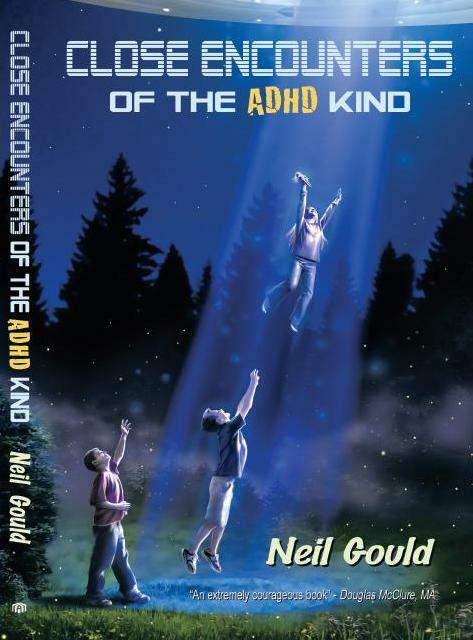 An ADHD challenged author wired into a multidimensional reality, Neil has endured contact experiences with off world beings. Previously judged as a man who lived in a world of fantasy by his peers and family, it was not long before these views were dispelled; a craft of gigantic proportion appeared close up in front of him, his family and friends in Hong Kong, but not before morphing from a bat winged shape into a circular donut shape which then became transparent. Frustrated by the experiences, Neil found his peace within the Exopolitics Institute, founded by Dr Michael Salla PhD assisted by Angelika Whitecliff in 2005. Neil graduated from the Institutes Certification Program with a Diploma in Exopolitics. In 2010 Dr Salla invited him to join the Exopolitics Institute’s Board of Directors. Neil’s activities include lecturing on exopolitics, co-hosting a Hong Kong Exopolitical Radio program, producing Exopolitical films on YouTube and developing alternative and cleaner energy technologies with his production facilities in China. I have demonstrated that the ADHD brain needs feeding with stimulation. It creates apparent chaos as part of the solution. But do not for one minute believe that everything you read or hear about ADD or ADHD people are lies or fantasies. I hope that sharing my experiences will create a wider understanding of this condition and dispel the myths. Shortly after moving into the house in Ocean Way, I developed an unexplainable fear of the dark. This was serious. I would never open a cupboard at night or leave a single part of my body uncovered from my sheets. My father spent time talking to me about the fear being irrational. He would open cupboards and show me nothing was there. These lessons were scary because they were done at night, the time that was most fearful to me. To be left alone or not have someone lay next to me would mean I could not sleep. Nights became my enemy, my worst fear. The demons were hidden there. I was aware of something, something that was masked and hidden from me. I had nights where I would experience something the doctors called temporal paralysis or sleep paralysis . I would feel a heavy pressure on my chest. I was awake but unable to move, frozen or paralyzed. One night I awoke feeling as calm as a cucumber. This was unheard of. My eyes were closed but I was awake. I had never in all my life felt this kind of peace. No fear, just a feeling of someone there that cared deeply for me. I sensed this very clearly and decided to bravely open my eyes. There was a low misty glowing light in the room. Standing right next to me was a hooded person in a brown robe, perhaps only four feet in height. I felt that the being was feminine, but there was no way to really know. She began to communicate with me, not in words but in a mind-to-mind connection, a sudden rush of knowledge at once. It was as though she emitted a multidimensional pattern to me, or implanted my brain with a knowledge capsule. I closed my eyes in acceptance of her. She was still there when I opened them again five minutes or so later. She was now standing by the door, still peering at me and giving off a concentrated information package. It is hard to convey in words what she told me. The information was exciting and gave meaning as to why I am here and what my potential in this world is. It was spiritual and it was real, I was not in a hypnogogic state, I was not imagining things, I was not next to a transformer or electromagnetic power junction. The proof is in the results and the effect on my life today and the marvelous out of this world experiences that happened to me. Try to understand that the interface with this being was very physical yet dimensional in that, there were years of input from her in what might have been just minutes of time. The whole room was encased in a glow of conscious energy. I still feel close to “her” as I write this book. Her answers are already there, before I have to ask the question. It is as though the capsule has a time-release mechanism, releasing more information from her over the years as and when I need it. I have felt her presence often when in a dangerous situation, and suddenly received the knowledge and sense of calm needed to keep myself safe. Many people have their own rationalizations and explanations for my experiences. Personally, I believe she was a dimensional manipulator. These are beings that treat our genes in the same way doctors treat our illnesses or implant new organs. The creator created us, the doctors looked after us, and the dimensional manipulators upgrade us. Copyright Exopolitics Hong Kong. All rights reserved.